Young campers line up to form a major scale in a rudiments class at Youth Camp. 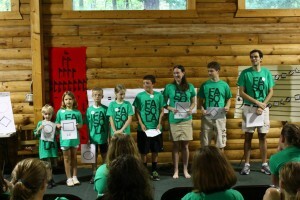 Make a tax deductible donation to support Camp Fasola. Camp Fasola is a project of the Sacred Harp Musical Heritage Association (SHMHA), a 501(c)(3) non-profit organization (EIN 63-1216235). Make a tax-deductible donation to Camp Fasola (a project of SHMHA, a 501(c)3 non-profit organization) in memory of five-time camper Oliver Kindig-Stokes, who died in October 2015 at age twenty-two. Learn more about the scholarship in Oliver’s name, and donate. Donate to Camp Fasola in memory of camp co-founders, Jeff Sheppard and Shelbie Sheppard. Donating to the Camp Fasola youth scholarship fund is a way to thank Jeff and Shelbie and all of those who work so hard to make Camp the amazing program that it is. Learn more, donate, and read about thank you gifts from Camp Fasola staff. Read camp director David Ivey’s tribute to Jeff Sheppard. Read camp director David Ivey’s tribute to Shelbie Sheppard.